Multimeters or multitester, also known as a VOM volt-ohm meter, measure volts, ohms, and amperes, and may have a variety of special features designed for a wide number of applications. Selecting a multimeter requires not only looking at basic specifications, but also the features, functions, and the overall value represented by a multimeters design. 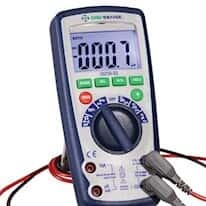 To choose the multimeter best suited for your requirements, consider your application, type of intensity measurement, accuracy and the measurement scope and method. Then look at additional multimeter measurements needed such as frequency, capacity, continuity, diode tests, temperature, etc.